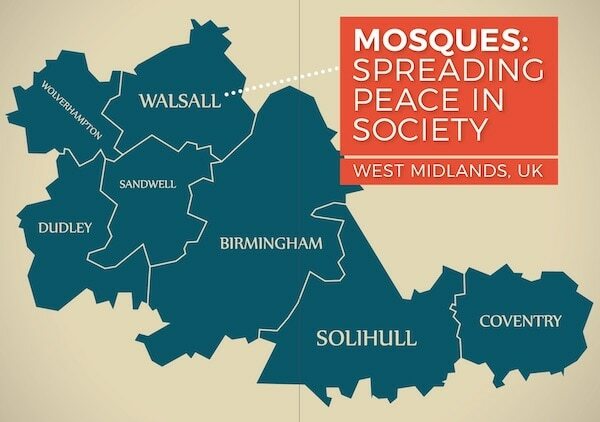 Taking over 7 years to acquire planning permission, the Baitul Muqeet mosque opened its doors to all members of the Walsall community, despite the opposition from fellow Muslim communities. 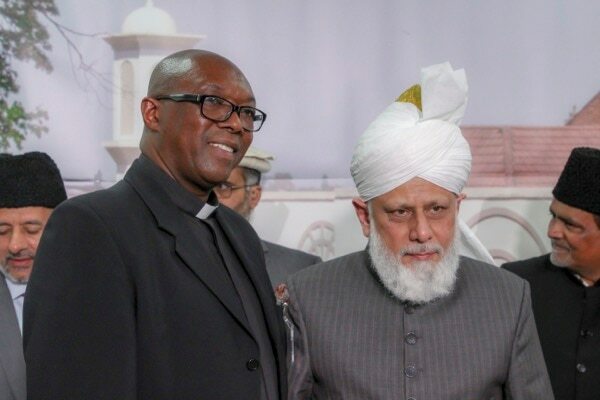 His Holiness was present to inaugurate the mosque and shed light on the true purpose of mosques in society. 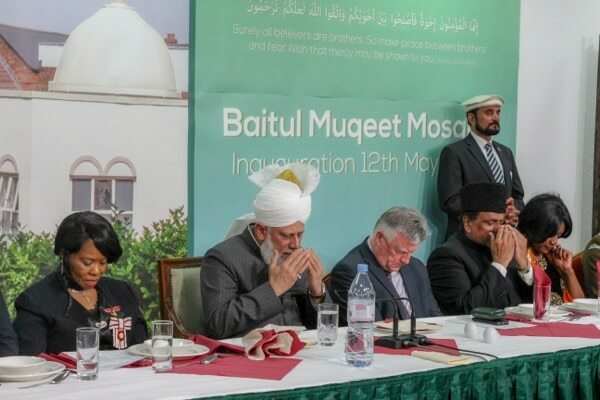 In May 2018, His Holiness, Hazrat Mirza Masroor Ahmadaba, inaugurated the Baitul Muqeet mosque in Walsall, located in the West Midlands region of the UK. 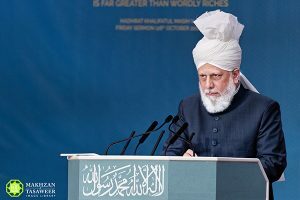 At a keynote address for guests, dignitaries and members of the community, His Holiness emphasised the duties that Muslims have to safeguard all members & their communities and to help and serve their neighbours. ‘All distinguished guests, Assalamo Alaikum Wa Rahmatullahe Wa Barakatohu – peace and blessings of Allah be upon you all. First of all, I would like to take this opportunity to thank all of our guests who have joined us at this reception to mark the inauguration of our new mosque here in Walsall. In today’s world, whilst it is customary for people to accept the invitations of others based on their mutual relations and to partake in each other’s moments of joy and celebrations, such events are rarely linked to religion. 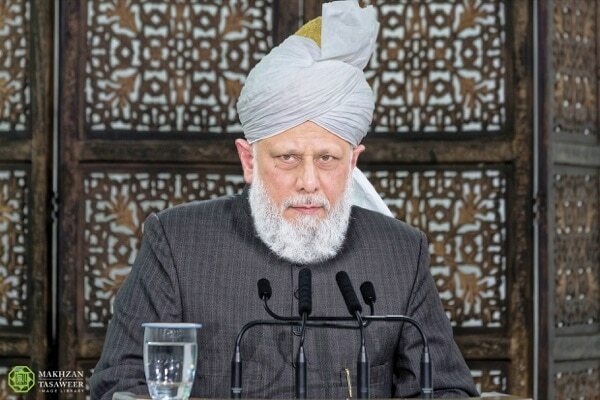 However, this is a purely religious function, where our mosque is being officially opened, and so the very fact that you have accepted our invitation, even though most of you are not Muslims, is a reflection of your open hearts and open minds and illustrates that you are tolerant and considerate people. Nevertheless, some of you, whether amongst our neighbours or other guests, may feel a degree of trepidation and harbour reservations about this mosque. You may fear that it will be used to sow seeds of division in society or to inflame tensions between different communities. 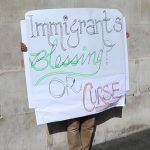 Certainly, I very much appreciate and understand such concerns because we are all tragically witness to the fact that some so-called Muslims have conducted heinous terrorist acts, both here in the UK and abroad in recent times. Such vile acts have created a climate of fear amongst non-Muslims and at the same time, have served to defame the religion of Islam. Similarly, for many years there has been constant disorder and violence in several Muslim countries, where civil wars have erupted and both sides have been prone to extremism and have attempted to forcefully seize control of power, irrespective of the resulting bloodshed and devastation. As a result of such senseless violence, hundreds of thousands of people have lost their lives. According to media reports, even a few Muslims from Walsall travelled to Muslim countries to join terrorist groups to fight. Perhaps, they believed they were going to fight in defence of Islam, but the truth is that whatever cruelties and evil acts they perpetrated were in complete defiance of Islam’s true teachings and proved only their total ignorance of the religion they claimed to represent. Considering this, some of you may question why wars were fought in the early years of Islam and so I should clarify that the early Muslims never fought aggressive wars or sought to conquer lands; rather, they themselves were the victims of sustained and brutal persecution and it was only after many years that Allah the Almighty permitted them to stand up and fight back in defence. Where this permission to engage in a defensive war is mentioned in the Holy Qur’an, the Holy Book for all Muslims, it categorically states that permission was granted to protect freedom of belief as a universal principle and was not granted just to defend Islam. Indeed, the Holy Qur’an states that if permission was not granted all churches, temples, synagogues or the places of worship of any religion would be in grave danger. Hence, the Holy Qur’an has made it crystal clear that it is the duty of Muslims to protect all religions and the people of all beliefs and to preserve the sanctity of all places of worship. It has enshrined freedom of belief as an indispensable and paramount tenet of Islam. which means the Provider and Sustainer for the entire universe and for every person and creature. Thus, when a Muslim bows before that Supreme Being, Who is the Provider and Sustainer of all mankind, and who is the Source of all Creation, it is impossible for him to harm any other person, whether from amongst his own community or not. 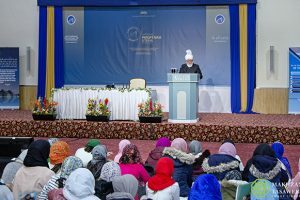 In other words, as the Provider and Sustainer for all people, we firmly believe that the One God Whom we worship – Allah the Almighty – provides, nourishes and sustains Christians, Jews, Muslims, Sikhs, Hindus and the people of all other faiths and beliefs. Indeed, it is our conviction, that He is the Provider and Sustainer for even those who deny His existence. 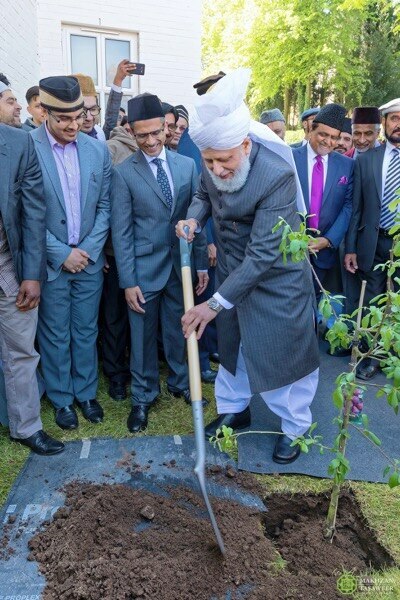 His Holiness plants a tree at the inauguration of Baitul Muqeet mosque in Walsall. When this is the reality of our faith, how could any Muslim, who claims to be a true worshipper of the Sustainer of all the worlds, ever envisage failing to heed the rights of others? Accordingly, a true mosque, built as a centre to worship the One God, is a place of love, compassion and harmony. It is a symbol of unity and a means to spread peace far and wide. Wherever the Holy Qur’an has given a commandment about mosques it has stipulated that those who enter should purify their hearts and join together in the worship of Allah the Almighty. For example, in chapter 7, verse 32 of the Holy Qur’an it states that after purifying yourself, both in terms of your conduct and attire, a person should enter the mosque. The requirement to cleanse one’s self physically and mentally is a means of protection from wrongdoing, vice and other dangerous influences. Muslims are bound to defend the right to worship of all faiths. It is particularly noteworthy that in this verse, God Almighty does not specifically address Muslims, but states, “O children of Adam!” and so He has invited all people, Muslims and non-Muslims alike, into the House of Allah. 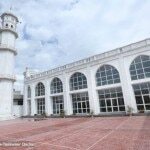 Therefore, it is a fundamental Islamic principle that mosques are open to mankind and Allah the Almighty has decreed that to prevent people from entering a mosque is a great cruelty and injustice. Most regrettably, we Ahmadi Muslims, are the victims of this very cruelty in Pakistan, where the laws prevent us from openly worshipping in mosques and practicing the basic elements of our faith. Having borne such persecution for decades, we are people who understand the great value and importance of religious freedom. Given this, we are extremely appreciative of the fact that the local people here in Walsall have enabled us to build this mosque and consider it testimony to your open hearts and respect for human values. I have already mentioned the teachings of the Holy Qur’an and now I shall present the example of the Founder of Islam, the Holy Prophet Muhammadsa. Throughout his life, the Prophet of Islamsa sought to unite mankind and to build bridges with the people of different communities and beliefs. He sought inter-faith dialogue and was ever mindful of the sentiments of other people. For example, on one occasion, a delegation of Christians from the Arab city of Najran came to meet the Holy Prophet Muhammadsa in Madinah where he lived. After some time, the Holy Prophetsa noticed that the Christian guests were becoming agitated and restless and so he enquired if something was wrong. In response, they informed that it was the time for their prayers and they had nowhere to worship. Upon this, the Holy Prophet Muhammadsa set an everlasting example of religious tolerance for all Muslims to follow, as he offered the Christians his own mosque to worship in according to their customs and beliefs. 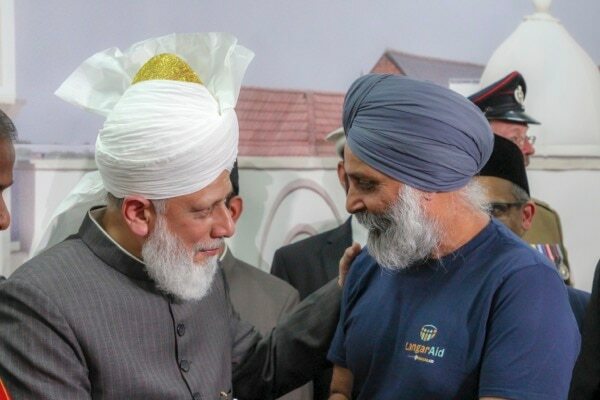 In light of this, I reiterate that true mosques are open to all people for the worship of the One Omnipotent God and so the doors to every mosque built by the Ahmadiyya Muslim Community, no matter where in the world, are open to the people of all faiths and beliefs. 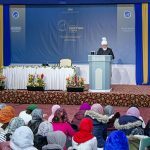 Furthermore, the Holy Qur’an has prescribed another timeless and profound principle in order to bring humanity closer together and to spread peace in the world. It states that the people of different faiths and beliefs should not focus on their differences, but should instead focus on those things that unite them, and for religious people it is the existence of God Almighty that serves to unite. 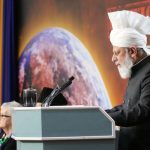 Thus, let it be clear that a true mosque can never be linked with any form of hatred or extremism or serve as a place where people plot any form of disorder; rather, apart from the worship of God, true mosques serve as a place for people to gather in order to serve humanity and to foster peace and harmony in the world. 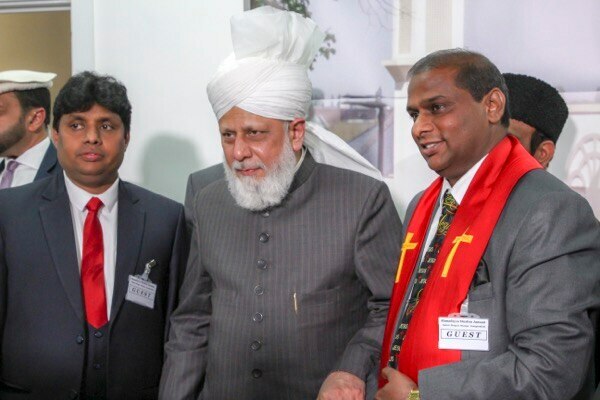 His Holiness met with many community members from Walsall during his visit. As I mentioned before, despite the fact that we are peaceful and law-abiding Muslims, we are deprived of the right to build mosques in certain countries. 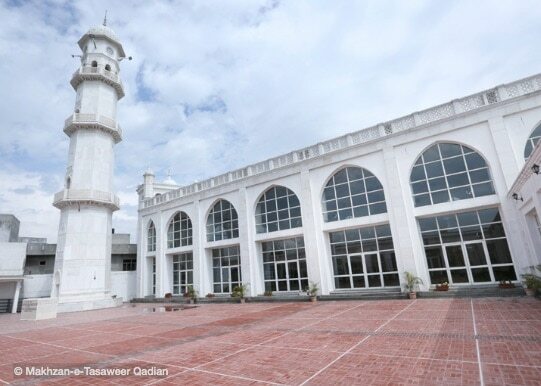 Consequently, we consider it a great favour of this town and its people that they have enabled us to build this mosque. You have shown that the people of Walsall and the surrounding communities are people who open their hearts to the people of different communities and beliefs. We will never forget this favour and consider it our religious duty to care for the people in this community, to be loyal to this nation and to be ever ready for your service and to offer our help and assistance wherever and whenever it is needed. Furthermore, we do not only strive to help those who have helped us; rather, bringing relief to others and alleviating the physical and mental suffering of mankind is our mission and an integral part of our faith. For example, in Africa, irrespective of religion or belief, we have established schools and hospitals that are providing education and essential healthcare services to the local people. We are also providing electricity through the installation of solar panels to communities that had previously been entirely off the grid. Furthermore, we are seeking to tackle the water crisis in Africa by installing water pumps that are providing clean water in some of the most remote and deprived villages. The Holy Qur’an states that Muslims must defend all places of worship including synagogues, temples and churches. Unquestionably, water is a huge issue in Africa, where every day women and children walk for miles on end, with vessels balanced on their heads, to bring water for their families. Even that water, for which they struggle so much, is contaminated with bacteria and often a cause of disease. Hence, when such deprived people suddenly have access to safe and clean water at their doorstep they celebrate as if they have attained all the treasures of the world. The happiness and unbridled joy on the faces of young children when they see water flowing from a tap for the very first time is indescribable. Nevertheless, we do not consider that we are doing them a favour, rather by enabling us to fulfil our duties to serve others, they are helping us. This is true Islam. It is a religion of compassion and benevolence and a religion that seeks to knock down the walls of injustice that divide us through the power of love and humanity. Hence, we seek no reward or praise for our service from any person, organisation or nation. We seek only the reward of our Creator, Allah the Almighty, Who is the Provider and Sustainer of all mankind. 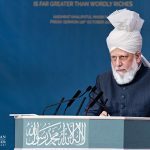 If Islam’s teachings were to be distilled into one line they are, quite simply, to worship God Almighty and to fulfil the rights of our fellow beings and it is to fulfil these two overriding objectives that all our mosques are built. His Holiness leads the guests in silent prayer. Now that this mosque has opened, I hope and expect that the local Ahmadi Muslims living here will not only fulfil the rights of worship in this mosque but will continually increase their efforts to serve the members of the local community and prove to be the best of citizens and neighbours. May Allah enable them to do so.